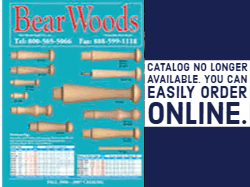 Bear Woods has been serving our customers with woodworking parts and more since 1987. 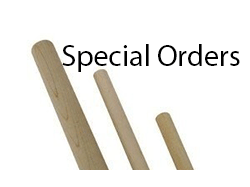 We are committed to helping our customers to begin, add to and complete their woodworking, picture hanging, clock making and wood craft projects. We have carefully selected products that we can assure are of high quality. 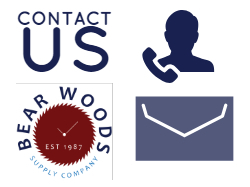 We serve thousands of schools, woodworking shops, furniture makers, craft-makers, clock makers, picture framers and more. Take their word for it. 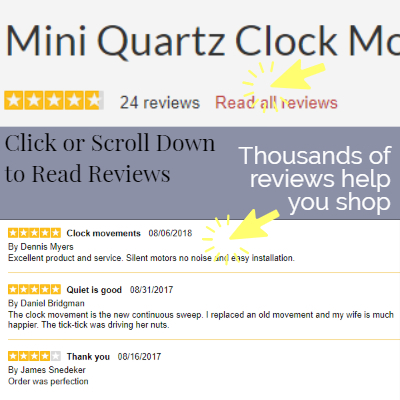 Reviews are everywhere on our website - comments appear alongside many of our products - take their word for it - we deliver as promised and provide great value.Thank you for your reviews! 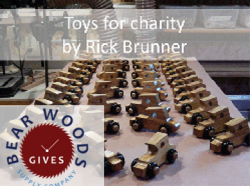 It helps others learn about our woodworking and craft products. Giving back is part of who we are - Join us! 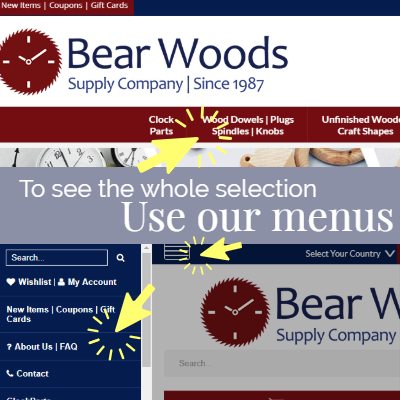 Bear Woods Gives to the communities our customers live and work in - watch our newsletters for opportunities to give - we match all donations. 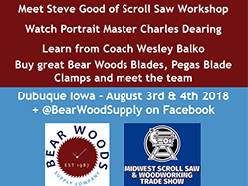 You can also check out Bear Woods Gives page for more information. Location: Our Canadian headquarters is located near Vancouver, BC at 6099 228 Street, Langley, BC V2Y 2L3. Can I Pick-up my Order? Yes, for most items! Order online, choose a shipping option, and then email or call us right away so we can hold for pick-up. We'll refund your shipping cost when you arrive. Or call us and we'll take your order by phone and hold it for pick-up. We aren't set-up as a retail store, but we do love to meet our customers and are happy to show you around - please just call ahead. Subscribe to our mailing list We will send you a letter once or twice a month with specials, stories about woodworking, opportunities to support the community work many customers perform, and more. We will accept orders Online (Most Secure), by phone, by fax, or if you have an account with us, by email. Occasionally items are out of stock or arriving to our warehouse shortly. If this happens we will notify you right away and present options. Quantities - what should you enter? A) Note the "Per 100 or Per 25 or Per 1000 or Each" comments you see in the name of the product and below the grid that displays pricing info. B) If the item says "Per 100" then Quantity of 1 means you get 100 pieces of the item. C) Need a quantity we don't advertise? Call us or email us and we will see if we can help. Yes! Contact us and we can discuss payment on account options for businesses, schools, and other institutions. Not everyone will be accepted, but we will happily discuss. At the moment, no we do not - we haven't produced a paper catalog since 2007. If you have an old catalog, most of the products are still available - either search the site for pricing or current availability, or call us - we can help! If you want to see our old 2007 catalogs - click here and you can see a PDF version. Note - Pricing is out of date! Contact us or search the website by SKU/Part Number for current pricing and quantity options. Here's a little snippet of a video discussion we had with some customers about our catalogs. 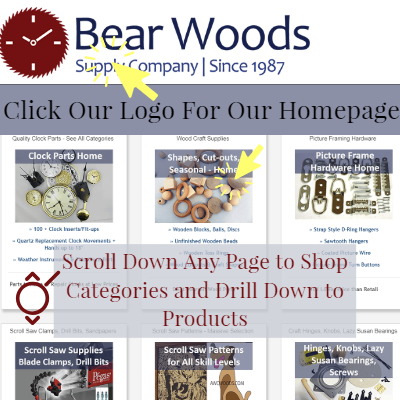 Please visit www.bearwood.com, which lists the same products, but in US Dollar pricing and international shipping options. From there, use your postal code to estimate shipping, and when you are checking out, select "International" as your State. 1) We ship Monday through Friday (closed statutory holidays) and endeavor to ship most items before end of next business day. We ship Express orders same day when received before noon Pacific Time. (But you can always call us and we'll do our best to help). 2) Products ship from either our warehouse in Pacific Northwest, or from one of our production facilities that are spread throughout the US. 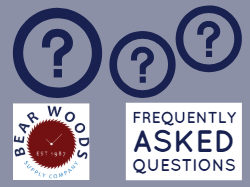 3) Bear Woods ships lets you choose from options available with the Postal Service and with UPS. 4) From the Shopping Cart (link is at the top left of every page) when you enter your Postal Code, and select the country you are shipping to, the page will generate shipping options. UPS services are denoted with available options. Shipping to Canada is Via Canada Post or UPS. All Options include Insurance. 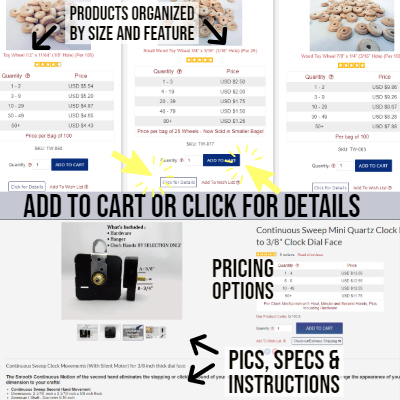 Check out great new woodworking products and find new clock mechanisms. Questions about our website? Just ask as! » Ohio, Iowa and LIVE on Facebook!